City of Stonnington are currently assessing the merits of a mixed-use, staged development that would replace the Victoria House Medical Imaging complex fronting Malvern Road, Prahran. 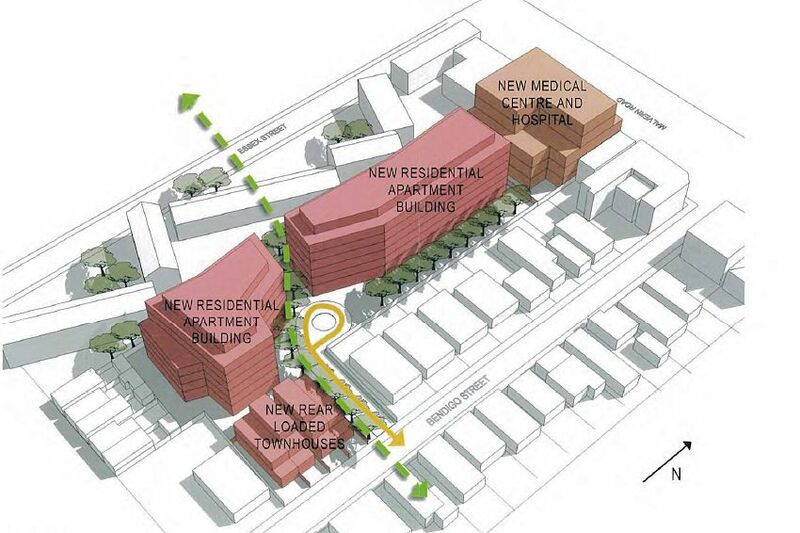 Included within the proposal is a hospital, enhanced medical hub and two residential buildings combining to provide in excess of 150 apartments. 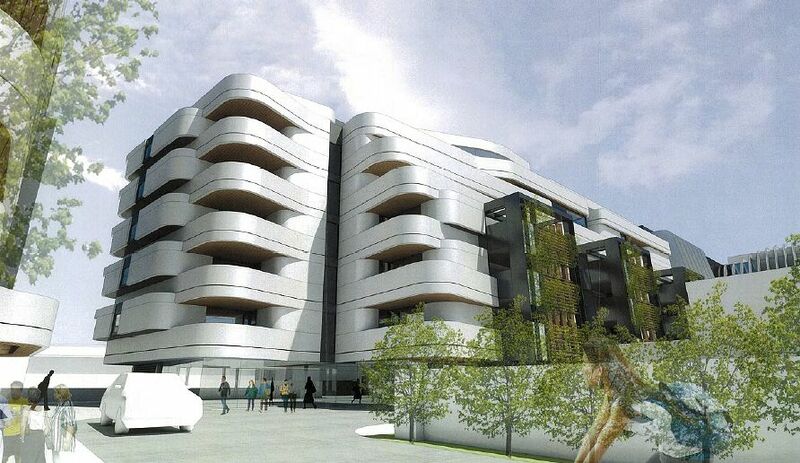 Rothelowman have designed the project with Victoria House Nominees Pty Ltd the proponent and long time onsite operator. Initially lodged during May 2014, enhanced plans were put forward again during November 2014. Running north-south, the elongated site's most visible aspect is that facing Malvern Road. Consequently this frontage carries a large degree of articulation and is a reflection upon the existing and prospective tenants that will utilise the facility. 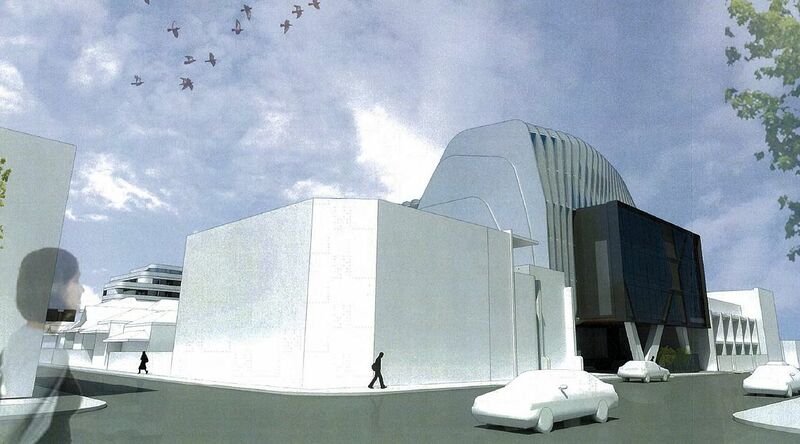 The design for the new Medical Centre loosely draws inspiration from concepts of 'motion' and 'body imaging'. Vertical blades, which also act as functional sun shading devices, shift across the facade, sculpting the upper levels. While the lower street wall explores the notion of transparency, the apartments buildings and townhouses have been designed to have a unique but complimentary character to the medical centre. The Medical Centre and Apartments buildings explore notions of rhythm, density, reflectivity and flow to create an architecture that is distilled and clear. The site in question also shares Essex Street with an existing DHS Housing Estate which is earmarked for development as part of the Prahran Estate Renewal. It's highly likely a number of new buildings in the 6-9 level range will be conceived for the DHS site immediately west of 310-324 Malvern Road in the medium term. Rothelowman have provided the development with a public pedestrian link that as envisaged will continue through the DHS Estate development with direct access to Princes Gardens. In this way 310-324 Malvern Road also supports DHS' key principles for redeveloping their site which includes maximising amenity, improving safety and security plus supporting social interaction. While only six levels, the medical centre manages to include a diverse number of uses within its walls. Atop three levels of basement car parking will sit a day procedure private hospital (basement 1, ground, level 2) while a dispensary/cafe is also located at ground level. Level 1 involves a GP Clinic with levels 3 and 5 dedicated to specialist medical suites, leaving level 4 to Victoria House Medical Imaging. Stage 1 of the development involves relocating current medical centre tenants to existing buildings onsite in order to facilitate demolition and construction of the new Medical Centre. The apartment buildings would follow thereafter. Rothelowman have continued their stellar run of creating multi-building developments with 310-324 Malvern Road. Attractive and considerate of the public domain, this Prahran design joins the award winning Tip Top Brunswick, 185 Rosslyn Street and 60-82 Johnson Street as recent Rothelowman offerings that tick many design boxes. While not mesmerising in its beauty, an historic 1893 double storey structure is one of two fronting Malvern Road slated for demolition. According to the planning report no Heritage Overlay applied to the site, with permission not required to demolish existing structures. Heritage structures don't grow on trees and it seems a shame that Prahran is set to lose a slice of its heritage, albeit for a highly impressive new development.